Weed resistance issues are nothing new for university researchers and the farmers they advise. Nevertheless, science continues to partner with agriculture to find ways to address the challenges of herbicide resistance in crops like tomatoes, melons, and a host of other agricultural applications. The popular Weed Day at the University of California stands as a shining example of such concern. For at least the last five years. The annual event has drawn a capacity crowd to address herbicide resistance to weeds impacting everything from rice to rangeland and row crops to trees. The 58th annual Weed Day at UC Davis drew about 160 participants, according to university weed scientist and event Chairman Brad Hanson. The purpose of the event is to draw people together to discuss the science related to weed control measures, Hanson said. “Beyond the specific research that is presented at Weed Day, this serves as a great networking opportunity for many of us that work in weed control in California,” said Hanson. One such topic of continual research is what Lynn Sosnoskie; an assistant project scientist at UC Davis is working on related to tomatoes and melons. According to a paper written by Sosnoskie, Hanson, Seth Watkins and Oscar Morales with the UC Davis Department of Plant Sciences, several factors have combined to aid the proliferation of bindweed in processing tomatoes. The change in planting practices from seeds to transplants, a reliance on mechanical harvesting, minimum tillage practices and a greater adoption of drip irrigation have not only helped processing tomatoes expand yields to over 45 tons per acre, but have aided in the proliferation of field bindweed. Sosnoskie is studying herbicide-resistance issues in bindweed, a particularly troublesome weed in processing tomatoes and melons. It not only competes with the vegetable crops for water and nutrients, but in processing tomatoes can cause problems with mechanical harvest techniques. “I'm just doing the work that Tom Lanini started here before he retired,” Sosnoskie said. Sosnoskie has multiple tomato research trials on two field sites on the UC Davis Campus. The California Tomato Research Institute is sponsoring a study to evaluate field bindweed control in early- and late-planted processing tomatoes. Part of her work includes dose-response experiments. This includes spraying bindweed with various rates of commonly-used herbicides that are licensed for commercial use in California and then watching the weeds in a greenhouse setting for signs of resistance. These experiments are looking at post-emergent herbicides for their damaging effect on bindweed at various stages of growth in a greenhouse setting. The aim is to discover how application timing impacts the plant. Sosnoskie is in her second year of these studies. 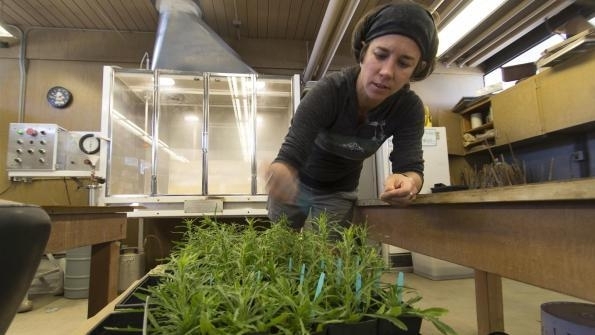 She plans to publish her findings in Weed Science Journal by early next year. “I'm more of a biologist, so I like to look at how resistance management works,” she said. According to Sosnoskie, bindweed is one of the worst weeds that can impact tomatoes, particularly once it becomes established. Bindweed is a deep-rooted, drought-tolerant perennial weed. “It's very difficult to control at that point,” she said. “It's also a problem in young orchard systems because it can impact the young trees,” Sosnoskie continued. One of the things Sosnoskie discovered in her research is the timing of glyphosate applications is important in the control of bindweed. Still, she says it is not a simple weed to manage. Starting with a clean field, particularly in melons and tomatoes, is vitally important at staying ahead of bindweed outbreaks, Sosnoskie continues. Burning down weeds, good tillage practices, and a good pre-emergent herbicide program can help farmers control weeds in these crops. Based on research conducted from 2011-2013 on campus and at the UC West Side Research and Extension Center, Treflan PPI was determined to be “one of the most effective soil-applied treatments for suppressing established field bindweed in processing tomatoes,” according to a university research report. For Hanson, the UC Davis Weed Day is a great place to address the problematic issues related to glyphosate resistance. Glyphosate- resistant crops have been released on the market, making it easier for weed control without damaging the crop. Couple that with the declining price in glyphosate products after the formula went off-patent and Hanson said growers are more eager to liberally use the product. A new mode of action to address the proliferation of glyphosate-resistant weeds is needed in herbicide control, Hanson said. Aside from the resistance issues, which seemed to dominate this year's discussions, weed control in rangeland settings were also discussed. Participants toured the USDA-ARS Aquatic Weed Research Facility on the UC Davis campus. Hanson was pleased with this year's event, saying that those attending represented an array of agricultural interests, including technical representatives from regional product distributors, UC Extension representatives including farm advisors and graduate students and representatives from various regulatory agencies including the California Department of Pesticide Regulation.